Every writing workshop begins with an introduction. Go around the room and introduce yourself to the group. Tell us who you are, how you got here. Fangirl. Cake baker. Hoopla maker. Amateur filmmaker. I was ten when my school principal phoned to tell me I had won first place in the school’s hobby show. It meant a trophy with my name on it! and a sleek red ribbon to glue in my scrapbook. A plain black binder of poetry had shut down the arts and craft hobbyists. Theirs were creations to admire. My poems and limericks had won praise at home. This was the real world. Words mattered, I learned. My words. Newly confident, I concluded an audience was needed; and so began to corral the neighbourhood kids to my backyard to sit on plastic lawn chairs and watch my dramatizations of fairy tales. They were a motley audience; there no doubt to see if I could get through my lines wearing a large paper mâché monster head. It had tiny holes not quite big enough to see through. There are days I’m still wearing that costume piece, but I’ve cut bigger holes since then. The audience grew a little at summer camp and high school as I further explored the stage lights. My performances were fantastic flops until I played the promiscuous actress Lois Lane and fell in love with the lead actor. The scripts belonged to others. My own writing was limited to diaries, stuffed with teen rants and angst. You are a natural. A writer! That bold definition stayed buried somewhere as I took off to Montreal to study literature, then film at McGill. I joined campus radio and became the news director. Back in Toronto, I worked part time in a bookstore before joining a television network as an intern, writer and soon, producer. Television writing honed my love of story yet I chaffed at ratings and promotional puffery. 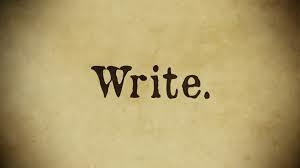 It took a kick out the door and a decade of writing workshops to push me toward the start line, naked and trembling. Still, hard silence on the page was common. I was too busy stuffing my days with those other definitions to be still and simply write. If writers require quiet, what was I doing being so busy with all those things I loved? Join me, reader friend, as I tend to those early seeds. Maybe I’ll get lucky. Sexpot Lois Lane lurks yet, threatening a ruckus.